I'm finding more and more ways to use Pinterest every day. I've created a Pinography to share head shots, testimonials, news coverage, etc. I keep track of all the cause marketing campaigns I read about on three major boards: Register, Digital, Employee. My new book, which will be out next month, has a URL and QR Code at the end of each chapter that will link the reader to a Pinterest board with additional examples of the chapter topic. I have personal boards on my Yarden and, of course, boards on Boston and…ahem...the Yankees. Now I have another board thanks to the launch of Place Pins. According to Pinterest, Place Pins were created to make the pin board more useful for travelers. But I think they have potential for nonprofits and business partnerships as well. Use Place Pins to share cause promotions. Nonprofits of all sizes can use Place Pins to track and share businesses that are hosting charity promotions. 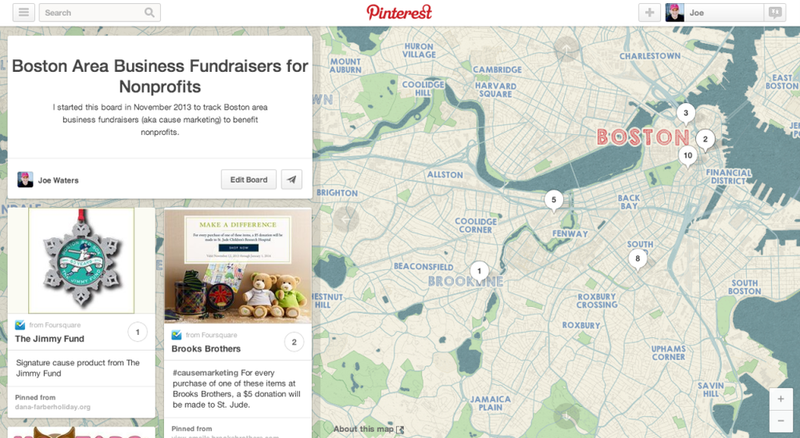 For example, I created a pin board called Boston Area Business Fundraisers for Nonprofits. A Boston nonprofit like the Jimmy Fund could create a similar board of business supporters. Pinterest allows you to share the entire board with supporters via email. Looking for a Christmas gift that also supports the Jimmy Fund? Check out their map of business supporters and what's being offered. The key here is that it's visual and easily viewed on a mobile device. Use Place Pins for a shopping fundraiser. One of the chapters in my new book looks at shop-walks - a shopping fundraiser that happens at multiple businesses in the same area on the same day. For example, in the aftermath of the Boston Marathon bombing, salons and shops in Boston’s Back Bay hosted a shop-walk to help stylist Celeste Corcoran who, along with her daughter, Sydney, was severely injured in the blast. You could use Place Pins to map all the different locations along the route and what each business is offering. Use Place Pins for a Pinterest contest. Encourage supporters to visit businesses that support your cause and to add an image to their own Place Pin board with a contest hashtag. The Pinterest user with the most pins wins! Use Place Pins to plot business prospects. If I was still managing a team of cause marketers, I would use Place Pins to map out prospects. I know this would help me because I like to view things on a map. It would also help to see where different businesses are located and how close they are to each other, which may lead to a cross-promotion. These are just a few example of how nonprofits could use Place Pins. I'm sure there are many more. How will you use Place Pins?